The particle size distribution (PSD) and the microstructure of non fat-particles in chocolates are very important for the quality of chocolate products (and particularly for their appearance, mouth feel and texture). In this respect, refining and conching are the most critical stages in chocolate processing, as they define particle size. 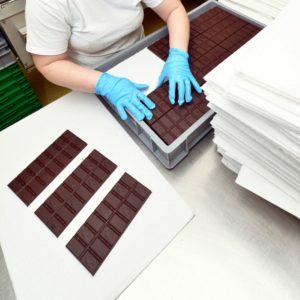 At present, the technologies available for determining the size of cocoa particles are based on the use of laser analyzers, which – being particularly expensive – are not accessible to small manufacturers. Hence, in a recent study by a group of US researchers (Tan & Balasubramanian, 2017), three potential alternative methods have been tested by micrometer, light microscopy image analysis and Hegman gauge. Also, during the tests the influence of the processing system configuration (with conical and cylindrical rollers) and of the quantity of processed product (1, 1.5 or 2 kg) were studied. The results show that, with respect to conical rollers, cylindrical roller stones tend to generate thinner and flatter particles during the first 4 hours of refining, whereas varying sample weights only influenced particle size reduction at early stages of refining. Furthermore it was observed that the Hegman gauge failed to provide reliable results as it cannot correctly identify the extremities of the particles. The data obtained by micrometer and optical microscope are less detailed but in line with those of traditional methods. Therefore, the methods based on these devices are a valid and economical alternative to the use of conventional laser analyzers. Impact of different starter cultures on the fermentation process of cocoa. Cocoa beans fermentation still is a craftsman-like stage in cocoa processing, and hence it is not being properly investigated. Since this stage can significantly influence the quality of its by-products (i.e. Chocolate) a recent study carried out by a group of international researchers (Visintin et al., 2017) investigated the impact of starter cultures on the fermentation process of two different Brazilian cocoa varieties (PS1319 and SJ02). In particular, for the tests the impact of mixed cultures of Saccharomyces cerevisiae and Torulaspora delbrueckii and Torulaspora delbrueckii monoculture were studied, studying the physico-chemical changes during fermentation, and analysing the volatile compouds and sensory analysis of chocolates. Additionally a DNA-based fingerprinting (GTG)-5-PCR) was used to assess the implantation of starter cultures. The results showed that S. cerevisiae ID 67 and T. delbrueckii ID103 can grow during the fermentation of both cocoa varieties. In particular, these cultures influence the quality of PS 1319 samples and, therefore, the product quality of chocolate; no big influences were observed on SJ02 varieties (probably for this variety an inoculum is required with a higher concentration). With S. cerevisiae, T. delbrueckii had a positive influence on the analytical profile of chocolates, especially of its sensory perception. In some cases there minor changes, that could be determined only via GC-MS, in some other cases even sensory changes were perceived. In conclusion, the Authors indicate that the results obtained until now, are very promising in order to improve the cocoa fermentation control, while optimizing the quality of its byproducts. Further consideration and analysis will be needed to analyse additional parameters, such as concentration of the inoculum, and other cocoa varieties.